In SQLAlchemy, database drivers are supposed to follow the DB-API standard, which does not usually provide a pool implementation. Therefore, SQLAlchemy has its own pool implementation, created directly in engine. This is where this diagram doesn't fit SQLAlchemy. The pool creates raw connections, not the GinoConnection green in the diagram. The connection in the diagram is a many-to-one wrapper of the raw connection, because of the reuse and lazy features, we'll get to that part later. 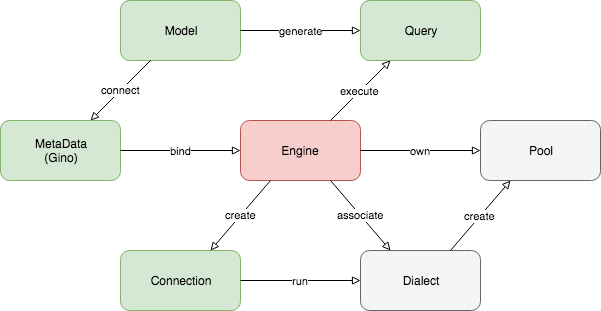 The connection is created by the engine, thus inherits the same dialect, and is used for running queries. By immediately releasing a connection, GINO may not release the related raw connection when the raw connection was reused from another parent connection. We'll get to this later. Then let's get to some details. 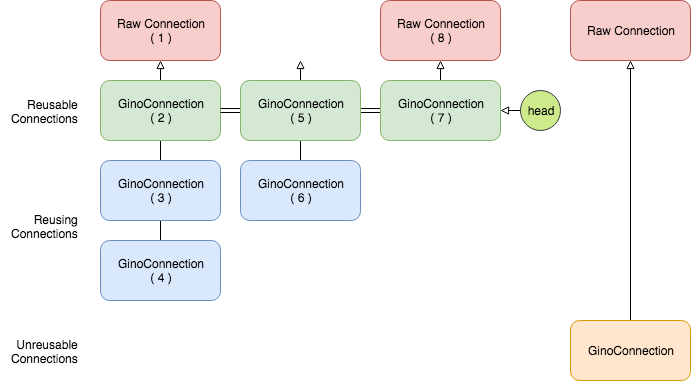 Back to previous diagram, the blue GinoConnection instances (3, 4, 6) are "reusing connections" acquired with reuse=True, while the green ones (2, 5, 7) are not, thus they become "reusable connections". The green reusable connections are put in a stack in current context, so that acquire(reuse=True) always reuses the most recent connection at the top of the stack. For example, (3) and (4) reuse the only available (2) at that moment, therefore (2, 3, 4) all map to the same raw connection (1). Then after (5), (6) no longer reuses (2) because (5) is now the new head of the stack. By context, we are actually referring to the context concept in contextvars the new module in Python 3.7, and its partial backport aiocontextvars. Simply speaking, you may treat a series of function calls in a chain as in the same context, even if there is an await. It's something like a thread local in asyncio. Releasing a reusing connection won't cause the reused raw connection being returned to the pool, only directly releasing the reused GinoConnection can do so. Connections should be released in the reversed order as they are acquired, but if the reused connection is released before reusing connections by accident, then all the reusing connections depending on it will turn closed because they are reusing the same raw connection which is returned to the pool, any further execution will fail. For example, if (3) is released first, then (2) and (4) are still functional. But if (2) is released first, then (3) and (4) will be released implicitly and are no longer usable any more. Unreusable connections can be lazy. But it is usually meaningless to specify both reuse=True and reusable=False at the same time, because reusing connections are always unusable - they are also not in the stack. You cannot reuse a reusing connection, you only reuse a reusable connection in the stack. Making a reusing connection unreusable doesn't make its related reusable connection unreusable. Hmm if this is getting more confusing, just don't use acquire(reuse=True, reusable=False) unless you know what it does. status() executes the query and discard all the query results at all. Instead it returns the execution status line as it is, usually a textual string. Note, there may be no optimization to only return the status without loading the results, so make your query generate nothing if you don't want any result. By "result", I meant RowProxy of SQLAlchemy - an immutable row instance with both tuple and dict interfaces. Database values are translated twice before they are eventually stored in a RowProxy: first by the database driver (dialect) from network payload to Python objects (see Type Conversion of how asyncpg does this), second by SQLAlchemy result_processor() depending on the actual type and dialect. In this example we didn't put the two queries in an acquire() block, so they might be executed in two different connections.